It was founded in the 16th century on the Inca city, it is the capital closest to the sun, situated in both the Northern Hemisphere and the Southern Hemisphere. Welcome to Quito, the pure energy center of Ecuador. 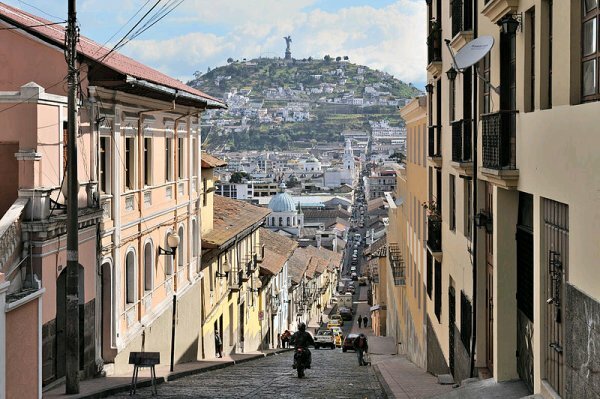 At an altitude of 2,850 meters, Quito is the best preserved historic city in Latin America and an unusual mix of Spanish, Italian, Moorish, Flemish and native art spreading through the city. This is best visible in its churches and monasteries, where interiors of places such as San Francisco and Santo Domingo, and the Church and Jesuit College of La Compaaía, are often called the Baroque school of Quito. From an artistic and historical point of view, this is definitively a place not to be missed. Some 20 kilometers north of Quito there is Mitad del Mundo, a place when you can stand in both the Northern and the Southern Hemisphere at the same time and where every tourist wants to take a picture. And nobody seems to care that the real Equatorial Line is some 240 meters away, Mitad del Mundo is still "the centre line of the Earth". We guess it would be too much pain to explain to the world "Well, we've been wrong from the 18th century." Anyway, the old complex is well worth to be seen before you return to the city to explore its amenities. Quito may thank his mix of cultures to its strategic position. It is a starting point for going to the Pacific Coast if you're into beaches, great sea food and want to see a number of small towns founded by fishermen. A bit further on the sea there are one and only Galapagos Islands. Or, you can follow volcanoes on their way to Los Andes. You can also explore the Amazonia with its jungles and ancient cities that stand the test of centuries. But, let's get back to the Quito, straight back to it historical center. The Centro Historico, one of the best conserved - and the biggest - city centers in Latin America, is where it all mixes: locals, tourists, working people, trades, and glorious architecture, all in one place. There are two mixes that you should experience. The first is their cuisine, a mix of ancient meals and all other cultures that came after Europe discovered the area. The second is art. 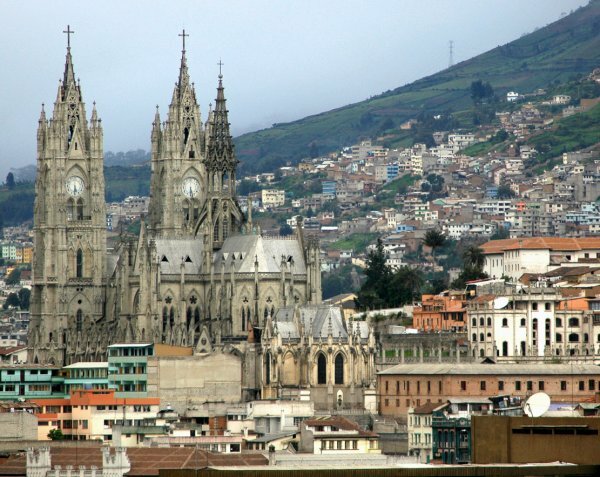 Quito is the place where you will have hard time to find a souvenir to bring back home - if you don't have enough money to buy everything you see. City museums are places you inevitably should visit because you are in the historic heart of Ecuador. Some of them are El Alabado with pre-Columbian art, the City Museum, Contemporary Art Center and the House of Music. There are also museums for children, like the Train Museum. While at trains, you should experience the toughest railroad of the world, the Crucero train. It will take you on a four day trip from Quito to Guayaquil, the coastal city, with great views on the surrounding nature and volcanoes. El Centro Historico, the Old Town with gorgeous buildings from the 16th century, is the best preserved old town in the Americas and this is The Place that offers you historic churches, monasteries and buildings, each with its own story from the past. A must see? Basílica del Voto Nacional, the largest neo-Gothic basilica in the Americas guarded by gargoyles made as pumas, monkeys, penguins, tortoises, and condors. No wonder that there in the Old Town you can also find art stores with beautiful pieces to take home. After you visited the heart of the historic center Plaza de la Independencia and waved to Ecuador’s president who will greet you every Monday, take a walk - there are free guided tours around the city! - and visit every street you see because almost in every one of them you'll see somebody selling tasty local food or a juice prepared in front of you. Something you really must taste: traditional grilled plantains. They are grilled on charcoal and when you ate them, you'll have enough energy for walking around all day long.